In a recent post here you could almost hear the disappointment in the climate scientists’ words as they recounted the terrible truth: that, despite what the models were saying would happen, snowpack in the mountains of the western U.S. had not declined at all over the last 35 years. This got me thinking about the weather, as weather over time equals climate. So I looked into the history of the Sierra snowpack. Interesting stuff. This chart accompanies a September 14th, 2015 article in the LA Times: Sierra Nevada snowpack is much worse than thought: a 500-year low. Now researchers say this year’s record-low snowpack may be far more historic — and ominous — than previously realized. A couple of commendable things stand out from this chart, and I would like to commend them: first, it is a very pleasant surprise to see the data sources acknowledged. From 1930 on, people took direct measurements of the snowpack. The way they do it today is two-fold: sticking a long, hollow calibrated pole into the snow until they hit dirt. They can simply read the numbers off the side of the pole to see how deep it is. The snow tends to stick inside the pole, which they can then weigh to see how much water is in the snow. They take these measurements in the same places on the same dates over the years, to get as close to an apples to apples comparison as they can. Very elegant and scientifilicious. They also have many automated station that measure such things in a fancy automatic way. I assume they did it the first way back in 1930, and added the fancy way over time as the tech become available. Either way, we’re looking at actual snow more or less directly. Today’s results from the automated system. From the California Data Exchange System. Prior to 1930, there were no standard way of doing this, and I’d suppose, prior to the early 1800s at the earliest, nobody really thought much about doing it. Instead, modern researchers looked at tree rings to get a ballpark idea. I have some confidence in their proxy method simply because it passes the eye test: in that first chart, the patterns and extremes in the proxies look pretty much exactly like the patterns and extremes measured more directly over the past 85 years. But that’s just a gut feel, maybe there’s some unconscious forcing going on, some understatement of uncertainty, or some other factors making the pre-1930 estimates less like the post 1930 measurements. But it’s good solid science to own up to the different nature of the numbers. We’re not doing an apples to apples comparison, even if it looks pretty reasonable. The second thing to commend the Times on: they included this chart, even though it in fact does not support the panic mongering in the headline. It would have been very easy to leave it out, and avoid the admittedly small chance readers might notice that, while the claim that the 2015 snowpack was the lowest in 500 might conceivably be true, having a similar very low snowpack has been a pretty regular occurrence over that same 500 years. Further, they might notice those very low years have been soon followed by some really high years, without exception. Ominous, we are told. What did happen? 2015-2016 snowpack was around the average, 2016-2017 was near record deep, 2017-2018 also around average. So far, the 2018-2019 season, as the chart from the automatic system shows, is at 128% of season to date average. What the chart doesn’t show: a huge storm is rolling in later this week, forecast to drop 5 to 8 feet of additional snow. This should put us well above the April 1 average, which date is around the usual maximum snowpack date, with 7 more weeks to go. Even without additional snow, this will be a good year. If we get a few more storm between now and April 1, it could be a very good year. And I will predict, with high confidence, that, over the next 10 years, we’ll have one or two or maybe even 3 years well below average. Because, lacking a cause to change it, that’s been the pattern for centuries. Just as the climate researchers mentioned in the previous post were disappointed Nature failed to comply with their models, the panic mongering of the Times 3.5 years ago has also proven inaccurate. In both cases, without even looking it up, we know what kind of answer we will be given: this is an inexplicable aberration! It will get hotter and dryer! Eventually! Or it won’t, for reasons, none of which shall entail admitting our models are wrong. It’s a truism in weather forecasting that simply predicting tomorrow’s weather will be a lot like today’s is a really accurate method. If those researchers from the last post and the Times had simply looked at their own data and predicted future snowpacks would be a lot like past ones, they’d have been pretty accurate, too. Still waiting for the next mega-storm season, like 1861-1862. I should hope it never happens, as it would wipe out much of California’s water infrastructure and flood out millions of people. But, if it’s going to happen anyway, I’d just as soon get to see it. Or is that too morbid? 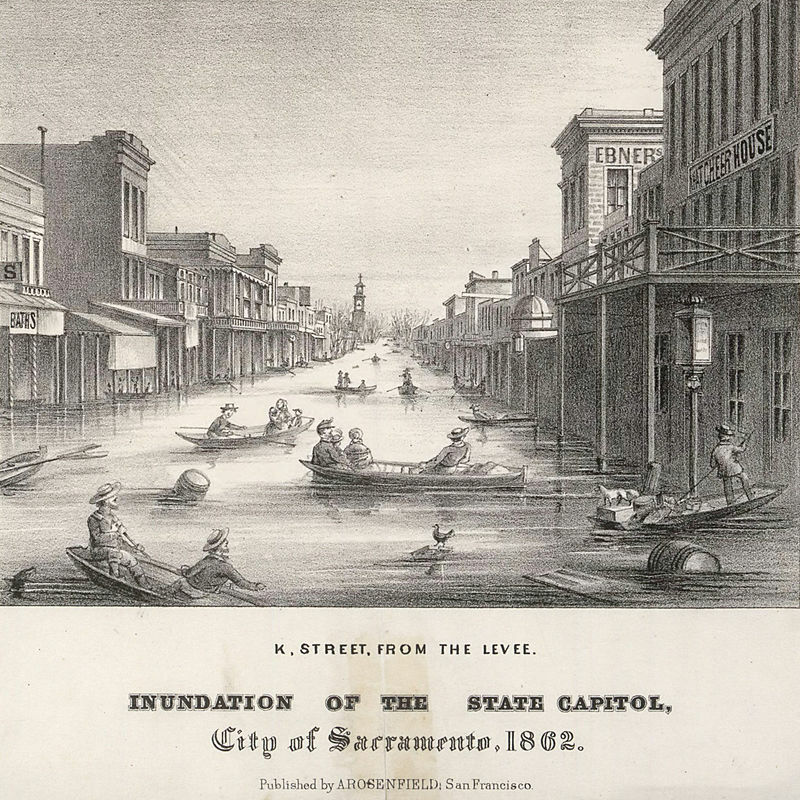 Great Flood of 1862. Via Wikipedia. Maybe morbid, but understandable. That would at least, more than likely, ‘get it over with’… unless a statistical freak happened, and California got hit by two back-to-back years of mega-storm city. That would be bad. Instructive, though, in a way only bad events can really manage.